ADALARD the YOUNGER, a monk at the Royal Abbey of St. Peter of Corbie, in Picardy, known as "the younger" to distinguish him from St. Adalard of Corbie (2nd January). He reposed circa 824. APRONIA (EVRONIE), the sister of St. Aprus (15th September), Bishop of Toul, from whom she received monastic tonsure. St. Apronia reposed in Troyes circa 420 following a life of holiness. ATHANASIUS, Bishop of Naples from circa 850 until his repose in 872. St. Athanasius was an exemplary pastor to his flock, though after 20 years he was subjected to the machinations of his nephew, Sergius II Duke of Naples, who first imprisoned him, then exiled him. He reposed in Veroli in 872 and was buried at Monte Cassino, his relics were later translated to Naples. BENEDICT, a ninth century Bishop of Angers in Anjou. St. Benedict reposed circa 820. CATULINUS (CARTHOLINUS), JANUARIUS, FLORENTIUS, JULIA, and JUSTA, (Date Unknown), martyrs at Carthage in Africa Proconsularis. Aside from their names, and that their relics were enshrined at the Basilica of Fausta in Carthage no further details are extant. DONALD (DONIVALD), (Eighth Century), Confessor of Scotland. St. Donald was a widower who lived a monastic life with his nine daughters in Ogilvy, Forfarshire (present-day Angus), Scotland. Upon the death of his wife, St. Donald converted his house into a hermitage where he and his daughters began to live a monastic life under his direction. They cultivated the land, surviving on a single meal of barley bread and water each day. Following St. Donald’s repose (circa 716), his daughters entered a monastery in Abernethy (Perth and Kinross) that had been founded by SS. Darlugdach and Brigid (both 1st February). There they came to be known as the Nine Maidens or the Nine Holy Virgins. Churches throughout Scotland were dedicated to the Nine Maidens. According to tradition, one of the churches, in Strathmartine, near Dundee, along with its Nine Maiden Well, is the location where the Nine Maidens were devoured by a serpent. To this day, the well is an object of great awe and reverence. EDITH of POLESWORTH, (Ninth Century), this St. Edith, was most likely a daughter of King Egbert. She should not be confused with St. Edith of Wilton (16th September). Both were connected to the Royal House of Wessex. The historical record is unreliable, but it seems St. Edith succeeded St. Modwenna (5th July) as Abbess of Polesworth towards the end of the ninth century. ETERNUS (ÆTERNUS), a seventh century Bishop of Evreux. St. Eternus reposed circa 660, no further information is extant. 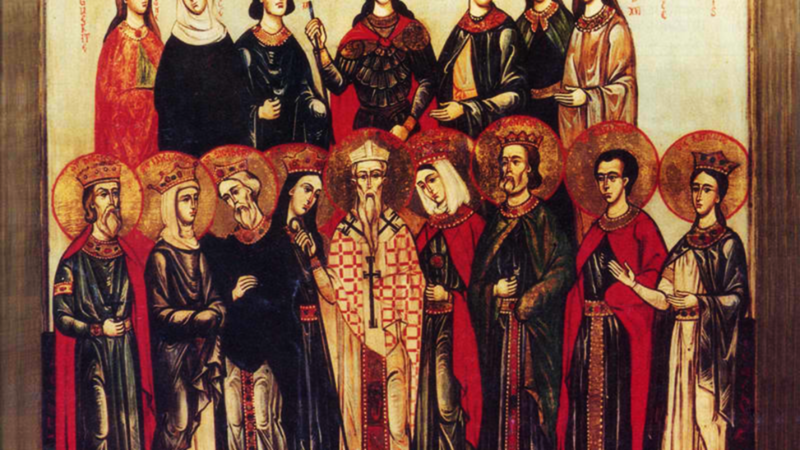 EUTROPIUS, ZOSIMA (ZOZIMA), and BONOSA, a brother (Eutropius) and his two sisters martyred at Porto Romano most likely circa 207, though circa 273 has also been given by some sources. FELIX of PAVIA, (Date Unknown), a bishop and martyr in Pavia. No further extant details of St. Felix’s life are reliable. HARUCH, an early ninth century bishop and/or abbot in Werden in present-day Essen Germany. St. Haruch reposed circa 830. SECUNDINUS, AGRIPPINUS, MAXIMUS, FORTUNATUS, and MARTIALIS, fourth century martyrs in Pannonia of whom nothing more than their names is known.